Every preschooler deserves a chance to shine because of the accomplishments they have achieved. Most preschools have a graduation ceremony to honor and cherish their students and the excellent work they have accomplished over the previous school year. If your preschoolers school does not offer a graduation ceremony you can use the free Preschool Diploma template that is located on this page. Even if your child’s preschool does offer a graduation ceremony it might be nice to throw your very own graduation ceremony with friends and family members present. The Preschool Diploma template is completely free and you can customize it to meet the needs of your preschooler. Celebrating the accomplishments of your child has never been easier with our easy-to-use, free to download the template that is located right on this page. Graduating is a very special time in any child’s life and should be celebrated. First, simply fill in the customizable template with you child’s name, the date of graduation, and any other details that you want to add. Be sure to save this template or email it to yourself, so you will not lose any information that you have added. Second, print off the diploma. Third, if you want to you can have it framed or frame it yourself so you can hang up your child’s diploma and advertise their achievements. First, instead of using the preset colors, try using colors that your child loves to add more value and uniqueness to the diploma. Second, if you do not like the idea of framing the diploma, try storing it in a photo album. Your children will want to remember this day for the rest of their lives. Storing and saving the diploma will enable your children to look back fondly on this graduation day. Third, before you print out the diploma, be sure that you have correctly spelled everything. While this diploma may just be a print-out, it will make your child feel special and should reflect their individual personality the best it can. Fourth, to add more value to the diploma print it on thicker paper, like a real diploma would be printed on. 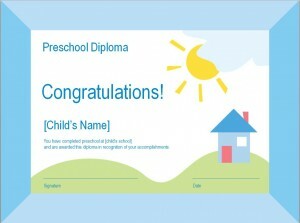 Every child deserves to feel special, so make their dreams come true by printing out this Preschool Diploma template. It will not only raise their confidence but it will also aid in nurturing their individuality.